So for the past few months my computer has been crashing randomly. Recently it's been more frequent, so I thought it's time to get a real fix. My computer never crashed before I got an external monitor, so I suspect that the monitor might be related to the issue. I have a 2010 Macbook Pro hooked up to a Samsung 23" LED Monitor using a HDMI - MiniDisplay Port. Sometimes when I am working on my computer, the computer will suddenly crash. When I say crash, I mean sometimes my external monitor will be completely purple and my Macbook screen will be black, other times they will both be black, and even both screen can be white. So when my computer crashes, the color always changes and is unpredictable. I can't do anything with my computer at this point. There is never a feeling of lag from the computer and the fan is usually quiet. There is no hardware sound when the screen flashes to a solid color. From there, I usually end up hold on to the power button to force shut down the computer. When I restart the computer, there is no error dialogue or anything indicating the computer crashed. So I'm not sure what is causing the issue, but I suspect it has something to do with my external monitor. If anybody has an idea, I would greatly appreciate it. Please feel free to ask me to provide any additional information about my machine and/or details of the issue! The problem you are experiencing is an issue known by Apple. It is an issue that plagued the 2010 MacBook Pro models (especially the 15" versions). The issue is called intermittent black screen or loss of video. At one point in time they had a replacement program for the affect models. They have discontinued that and all 2010 models are now in Vintage mode. Here's a link to the official Apple site talking about the problem. 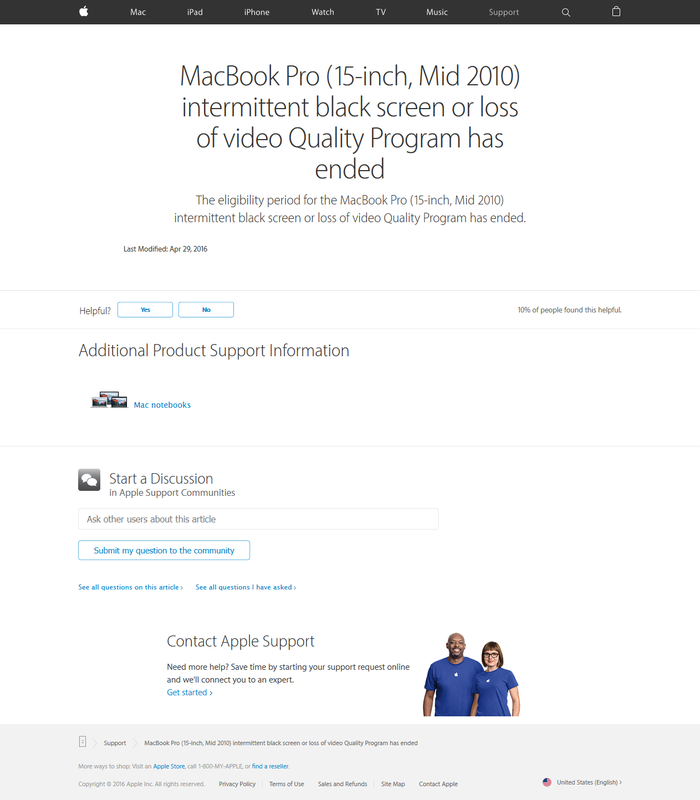 I actually joined this site trying to find some recourse due to the fact that the product was defective and Apple knew about it. This doesn't help, but it is the reason for your problem. Not the answer you're looking for? Browse other questions tagged macbook display memory crash . 2010 Macbook Pro keeps crashing in Adobe - does it need more video memory?